I just bought a plane ticket for one. I have four children, ages 3 to 9, which makes this purchase noteworthy. In a few weeks’ time I will pack a sensibly sized bag and fill it with things that belong only to me. Things that speak of a life beyond motherhood: clothes that don’t double as yoga-gear, books that can be read at will, toothpaste that isn’t fruit-flavored. I am a stay-at-home mom and for five days I will officially be on vacation. Consider this me punching in my time card. The average American worker is entitled to sixteen days of paid leave per year. If being a stay-at-home mom is tantamount to a full-time job, isn’t this a benefit we deserve as well? The obvious answer is yes. The reality is far murkier, both because of the nature of the “work” of parenthood and the extent to which it is valued by society. 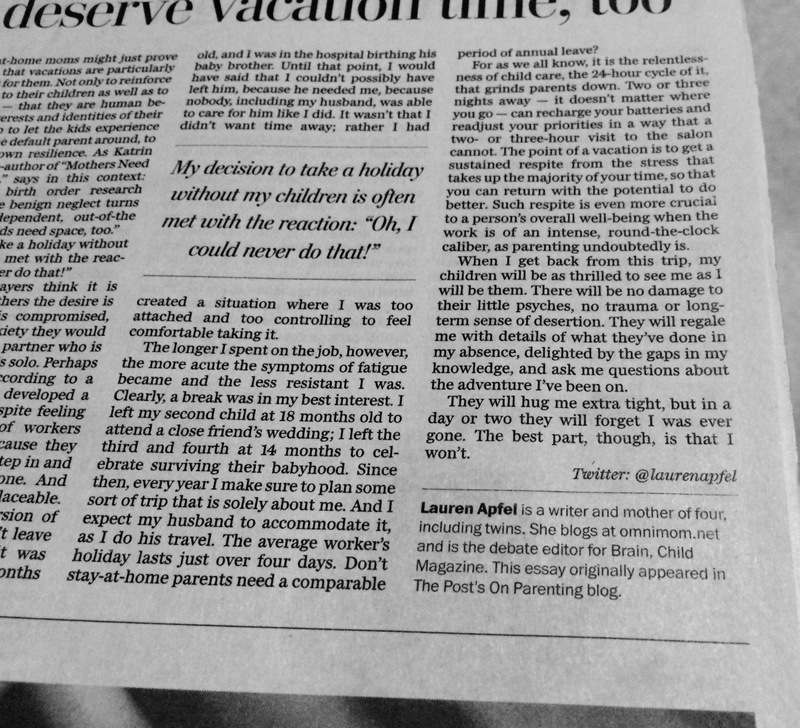 A child-free holiday, regardless of the parent’s employment status, is not without controversy. Especially when the parents take it together. Eight out of 10 people, according to one survey, say this is not something they could do with a clear conscience. In a poll in Parents Magazine, 30 percent of respondents were prepared to go further and suggest there is an element of moral reprehensibility to vacationing with your partner but not your baby. In today’s era of intensive, all-in parenting, where there seems to be an expectation that a child’s perceived needs trump its parents’ at any cost, a trip sans enfants can take on an undeniable sheen of selfishness. There is a paradox here, though. We talk ad nauseum about the exhaustion and manifold difficulties inherent in raising young children. Jennifer Senior has analyzed it painstakingly in her bestseller All Joy and No Fun, concluding that early parenthood is the phase during which people are, in fact, “least happy.” And yet, we are more hard-pressed than ever to give ourselves a proper break: the current climate of parenting tells us that enjoying extended time away from our offspring is indulgence at best, neglect at worst. You can read the rest of the piece here, in The Washington Post. Enjoy your trip, too. I’m sure the baby will be just fine and you will no doubt come home much refreshed! YES!! And love that it made it to PRINT! Absolutely love it. ENJOY! (And thank you for kind words about the piece). Have fun and OMG– how cool to have a print version of a great article in a MAJOR paper. Great all around. I went on an 8 day writing workshop alone and it was so unbelievably awesome. I don’t even care if it was morally reprehensible. SO be it! Thank you, Christie, was very cool to see the ‘dead tree’ version. 8 day writing workshop sounds beyond dreamy. Time away from kids is not reprehensible. It is essential and very healthy, both for mother and child. Knowing who to leave the kids with so they’re well taken care of, now that’s being responsible. So true – thanks for your comment. And I do realize not everybody has a selection of suitable babysitters on hand. With four kids, my cover usually involves a tag-team effort!